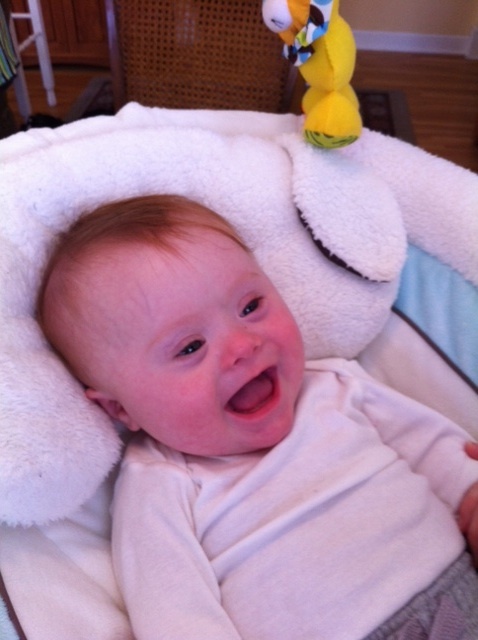 Someone recently asked about our reaction to the Down syndrome diagnosis for Timothy. It was exactly a year ago that we found out that our baby had Down syndrome. We had undergone early testing, some of which showed a higher risk of an issue. Laura and I talked and agreed that no matter what we found out, we would have the baby and make the best of the situation. But we (at least I) were sure that our baby would be normal. Even as the probability of a problem grew to 10% to 20%, the odds were still high that we’d have a normal baby. I’ll take those odds any day. But we wanted to do the remaining tests so that we could be prepared in case there was a problem. When the genetic counselor told us, after the amniocentesis, that the results indicated that we had a boy and that he had Down syndrome, I was shocked (‘this can’t be happening’). I didn’t realize how unprepared I was until I got the news. I also felt a sense of mission, knowing this boy would need our help. I felt no anger – but profound sadness, and a real sense of loss. Now, we’re not unique. Anyone who has received a negative medical result (‘you have cancer’, etc) or experienced real loss knows these emotions. Laura has lost both parents and knows this process better – but for me, this was a new deal (other than Notre Dame football, of course). Beyond the death of Laura’s parents, we’ve not dealt with much adversity in our lives. We know people who have been through such tough times and health issues and we’ve been very lucky. We also knew that this diagnosis, while disappointing, was also probably very manageable. That was pretty amazing. Whether that was God with good timing, a mature girl, or just really good parenting (hey — I’m kidding), it was just reassuring to hear those words at that moment. A few days after getting the diagnosis, we went on a long family driving trip to New Orleans for Spring Break. Laura was a good sport — only 50 hours of driving round trip in the car when she was 4 months’ pregnant. In addition to cleaning out our digestive systems with gumbo and other Cajun goodies, the trip both distracted us from our recent news and also gave us a chance to be together and talk. And by the time we got back to Minnesota, we felt more ready to move forward and start learning about Down syndrome and what it might mean for this little boy and for us. We all dealt with the news in our own ways and for me, I leaned heavily on my faith and prayed for courage and patience, and I also had full confidence that our family — both immediate and extended – could roll with this and see a great gift. In the end, knowing about Timothy’s challenges in advance was the best possible scenario because we were well prepared by the time he arrived. We still feel sad occasionally, and worry about Timothy’s future, but that’s life. And it’d be hard to put into words what a blessing this whole experience has been and how much we love this little boy. This entry was posted in Doctor, Down syndrome, Parenting lessons -- Don't try this at home and tagged Down syndrome diagnosis, New Orleans, Travel. Bookmark the permalink.